A rather awkward but well-intentioned World War Two prisoner-and-sports drama, Escape To Victory aims to recreate the vibe from The Great Escape but despite enjoying a few moments, falls well short. 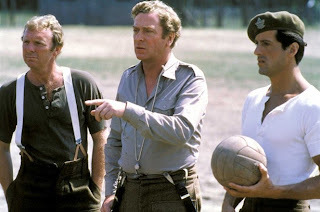 With World War Two in full flow, Englishman John Colby (Michael Caine) is a professional football player turned soldier and now held captive in a German prison camp. Colby tries to keep fellow inmates fit and entertained by organizing football games in the prison yard. 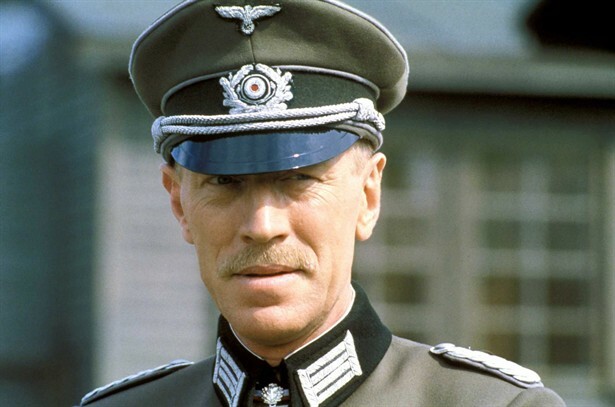 German Major Karl Von Steiner (Max Von Sydow), a former international footballer himself, spots Colby and suggests a friendly game between German guards and Allied prisoners. Colby agrees, and uses the opportunity to negotiate better food and sports equipment for his players. He assembles a team to include the talented forward Luis Fernandez (Pele) and the hot-headed American Robert Hatch (Sylvester Stallone), who knows little about football but proves to be a half-decent goalkeeper. But the game is soon hijacked for other purposes: much to Von Steiner's disgust, his German commanders elevate it to a major propaganda event, Allied prisoners now up against the German national team, to be played at a major stadium in Paris with the purpose of demonstrating German superiority. And the Allied escape committee at the prison camp see a terrific opportunity to organize a mass break-out for all the team members. Colby tries to keep the focus on the game and finds a higher purpose by insisting that East European prisoner footballers be released from torture camps and allowed to join the team. But as the game approaches, an escape plan cobbled together with the help of the French Resistance collides with the events on the field. Escape to Victory (also known as simply Victory) skips over all the important pieces that would have added a gloss of quality. The main characters of Colby and Hatch are roughly sketched with thick crayons and left to fend for themselves, and they beg for derivative familiarity from other movies. Colby is the Englishman who gets over-involved in a project aiding the enemy, recalling Colonel Nicholson from The Bridge Over The River Kwai. Hatch is the charismatic (or trying) loner obsessed with self-preservation and escape plans, echoing Hilts from The Great Escape. Escape To Victory itself uses flabby short cuts on the assumption that these characters are known from elsewhere, and invests little in building its own muscles. Caine and Stallone do not help matters by generally mailing in their performances. Caine really should have lost a few more pounds to at least try and convince as a hungry prisoner who is also a professional footballer. The few shots of him staggering around the pitch are plain embarrassing. Stallone plays Hatch as Rocky Goes To Prison, looking to stare down and fight all-comers. He is much better out of prison and off the football field altogether, and in a sojourn to connect with the Resistance fighters, Stallone slips into a smoother, more appealing groove. Max Von Sydow humanizes Von Steiner, but once his faint anti-war sympathies are established, his character has nowhere to go except as a doormat for both his commanders and the Allies. 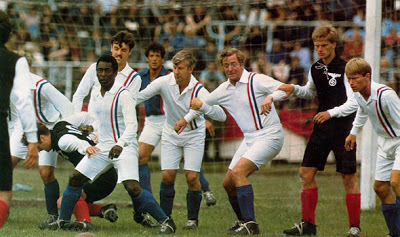 The main focus of the movie defaults to spot-the-international-football-star, and the film is full of them, including legends Pele (Brazil), Bobby Moore (England), Osvaldo Ardiles (Argentine), Kazimierz Deyna (Poland), Paul Van Himst (Belgium), and Michael Summerbee (England), plus a host of then-current top players from Ipswich Town, including John Wark and Russell Osman.The presence of so many actual players lends an immediate authenticity whenever the action moves towards the training or game scenes, and that is where Escape To Victory is at its best. Indeed, director John Huston pulls together an effective final 30 minutes, fully consumed with the climactic game. Within the confines of what is needed for a film production, Gerry Fisher's cinematography and camera angles capture the flow of a game notoriously difficult to fictionalize. The plays were designed by Pele, and the touches of the master are often evident in the mix of tackling, passing, running, jostling, heading and shooting, with the messiness of near-misses and clumsy saves (thank you, Stallone) as prominent as the few instances of perfect execution. Escape To Victory eventually escapes to average entertainment, an always hokey project ending with nets bulging, escape plans going awry, actors pretending to be footballers and actual footballers doing their best to accommodate bumbling impostors in their midst.